Congratulations to Cherie and Laura! You are the winners of my Sweet Summertime $25 MPM School Supplies gift card giveaway. However, everyone's a winner with a 10% discount code to use at MPM School Supplies! Just click on the following link and do a little back to school shopping this week! www.mpmschoolsupplies.com/redeem/1306SK3EC8KV The discount code expires one week from today. I also wanted to share a math station freebie I made yesterday for everyone. 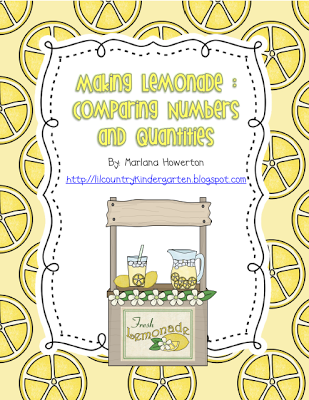 It is called Making Lemonade: Comparing Numbers and Quantities. Click here or on the picture below to download your copy. I hope you like it!